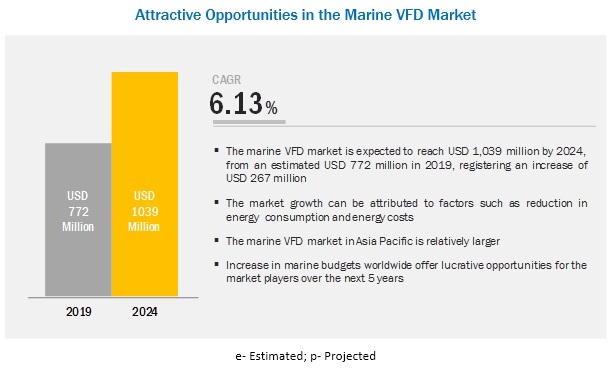 [103 Pages Report] The global marine VFD market is projected to reach USD 1,039 million by 2024 from an estimated USD 772 million in 2019, at a CAGR of 6.13% during the forecast period. This growth can be attributed to factors such as reduced energy cost, extended equipment life and reduced maintenance, and the growth of the shipbuilding industry. The report segments the marine VFD market, by type, into AC drive and DC drive. The DC drive segment is expected to grow at the highest CAGR during the forecast period. The main advantages of DC drives include excellent speed control, low cost for medium and high HP applications, and good speed regulation. All these factors are likely to drive the marine VFD market. The marine VFD market, by application, is segmented into pump, fan, compressor, propulsion/thruster, and crane & hoist. The pumps used in marine vessels circulate fluids inside different machinery and systems for cooling, heating, and lubrication, thus, consuming maximum energy during their operation. Hence, the pumps are installed with VFDs in order to increase energy efficiency, which is likely to impact the growth of the marine VFD market during the forecast period. Asia Pacific is estimated to be the largest market from 2019 to 2024. The growth of this region can be attributed to the strong economic growth and supportive government policies for the shipbuilding industry. China, South Korea, and Japan are among the fastest growing countries in Asia Pacific. The maritime industry in Japan, over the past few decades, has been the largest shipbuilding nation with products being built using advanced technologies. In South Korea, the government is trying to introduce FDI in the marine sector; this move has helped the Korean shipbuilding industry to attain the Electronic Control Unit (ECU) technology. All these initiatives are likely to boost the growth of the shipbuilding industry, and, as a result, the marine VFD market. The major players in the global marine VFD market are ABB (Switzerland), GE (US), Eaton (Ireland), Rockwell Automation (US), Siemens (Germany), WEG (Brazil), Danfoss (Denmark), CG Power and Industrial Solutions (India), Mitsubishi Electric (Japan), Invertek Drives (UK), Yaskawa (Japan), and Parker Hannifin (US). In February 2019, Yaskawa America launched the GA800 variable speed drive. It is available in 240 VAC 3-phase (1–150 HP) and 480 VAC 3-phase (1–600 HP) models. In April 2018, Invertek Drives launched a new range of IP66 outdoor rated VFDs at Hannover Messe 2018, Germany. The Optidrive E3 IP66 drives is an ideal solution for external fans, pumps, marine, and HVAC equipment. The drive range has power outputs up to 22 kW and is designed to provide precise motor control and energy savings. In June 2017, Mitsubishi Electric was awarded a contract by Sanssouci Star to provide FR-F800 inverter drives for the engine room HVAC system in its luxury Yacht. In November 2016, ABB launched a new all-compatible DCS880 drive. The drive offers built-in safety functionality and is also enabled for compatibility with the Industrial Internet of Things (IIoT). The drive has many readymade application programs such as a control program dedicated for industrial, harbor, tower, and marine deck cranes. In September 2016, GE Marine Solutions, a subsidiary of General Electric Company, signed a deal with Sembcorp Marine to supply electrical parts for a power and propulsion system, including 12 sets of 8 MW generators, 8 units of 5.5 MW propulsion motors, medium voltage switchboards, transformers, and the MV7000 drives. The report identifies and addresses the key markets for marine VFD, which would help manufacturers review the growth in demand. The report would help the key players understand the strategies of their competitors and make better strategic decisions. The report covers the market share analysis of the key players of the marine VFD market, and with the help of this, companies can enhance their revenues in the respective market. The report provides insights about the emerging geographies for the marine VFD market. Hence, the entire market ecosystem can gain competitive advantage from such insights. This study involved 4 major activities in estimating the current size of the marine VFD market. Exhaustive secondary research was done to collect information on the market, the peer market, and the parent market. The next step was to validate these findings, assumptions, and market sizing with industry experts across the value chain through primary research. Both top-down and bottom-up approaches were used to estimate the total market size. Thereafter, the market breakdown and data triangulation was done to estimate the market size of the segments and subsegments. This research study involved the use of extensive secondary sources, directories, and databases such as Hoover’s, Bloomberg Businessweek, Factiva, and OneSource, to identify and collect information useful for a technical, market oriented, and commercial study of the marine VFD market. The other secondary sources included annual reports, press releases and investor presentations of companies, white papers, certified publications, articles by recognized authors, manufacturer associations, trade directories, and databases. The marine VFD market comprises several stakeholders such as VFD manufacturers, dealers, and suppliers, shipbuilding companies, government and research organisations, institutional investors, and shareholders. The demand side of this market is characterized by its applications such as pumps, fans, compressors, propulsions/thrusters, and cranes & hoists. Various primary sources, from both the supply and demand sides of the market, were interviewed to obtain qualitative and quantitative information. After arriving at the overall market size-using the market size estimation processes as explained above-the market was split into several segments and subsegments. To complete the overall market engineering process and arrive at the exact statistics of each market segment and subsegment, the data triangulation and market breakdown procedures were employed, wherever applicable. The data was triangulated by studying various factors and trends, from both the demand and supply sides, in the marine industry. To forecast the growth of the marine VFD market with respect to the major regions (Asia Pacific, Europe, North America, South America, and the Middle East & Africa). This research report categorizes the marine VFD market based on application, type, voltage, and region.